All apartments are fully furnished. Each of them has a kitchen/kitchenette, bathroom (hot water 24/7), TV, Wi-Fi internet connection. Check-in time – 13:00. Check-out time – 12:00. In case of reservation for 7-days or more, a discount is provided. Housekeeping, linen and towels change is done once a week. Additional cleaning can be arranged upon request. Detailed information about each apartment can be found here. All the apartments are located on Svobody Ave. 1/3, in one unique historical building about which you can read below. Former building of Land Loan Partnership (currently – residential building with stores. 1809-1811; 1821-1822; 1893-1895 – partial reconstruction, architect Shults; 1950s – 4th floor topped out). Empire style. 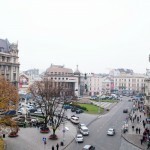 The building was constructed in the city centre on the west side of Svobody Avenue on the corner with Kopernika Street. Its side (northern) facade faces Kopernika St. The four-storey building is made of bricks, plastered, has a tile sloping roof, L-shaped with inner yard. Located on the corner of Svobody Ave. and Kopernika St. Built in two stages according to the project of an unknown architect: in 1809-1811 left side was built (building No. 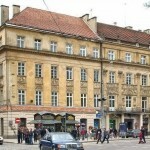 1 from Kopernika St.) and in 1821-1822 – the right side (building No. 2). Initially this building belonged to the trade-banking company “J. Hausner and V. Violand” (so called the Hausner stone house), and in 1845-1939 it became the property of the Land Loan Partnership. According to the record, austrian archduke Karol Ludvig lived here in 1853-1855. 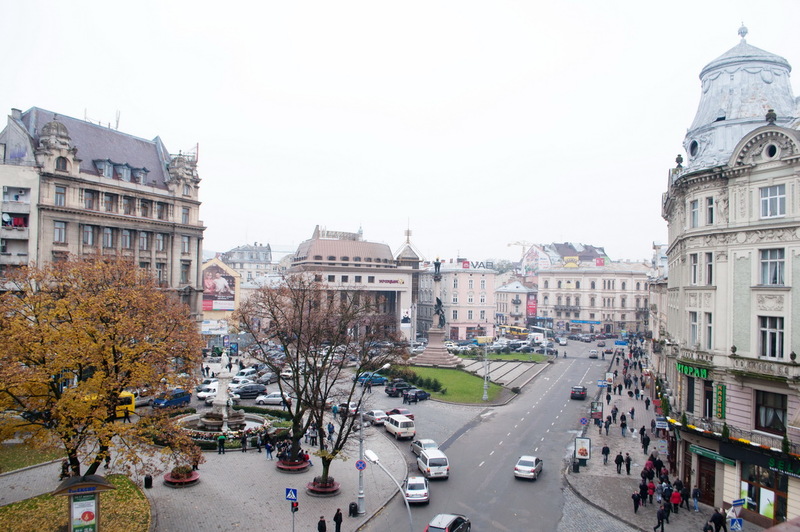 His arrival to Lviv was celebrated with fireworks and torch parade on Svobody Ave., which used to be named after him. In 1930s the Polish nobleman Wojciech Diduszycki lived here over the cinema “Palatsy”. 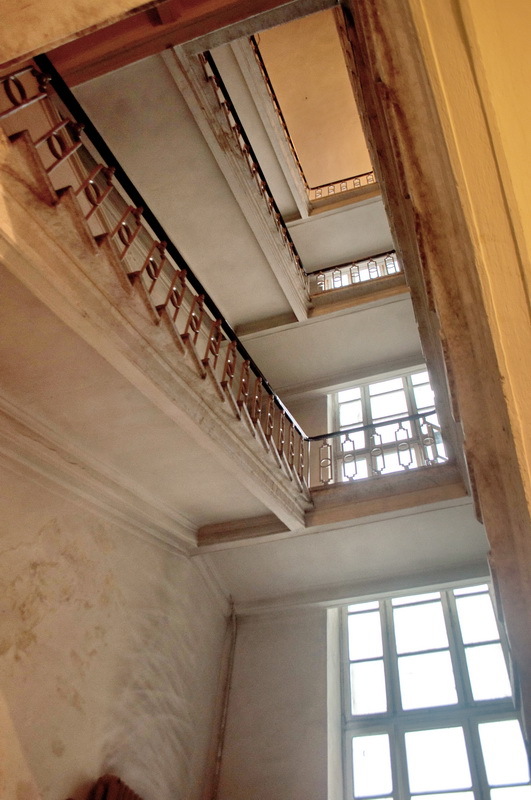 In the end of 1940s the forth floor was constructed according to project of Mykulyn. 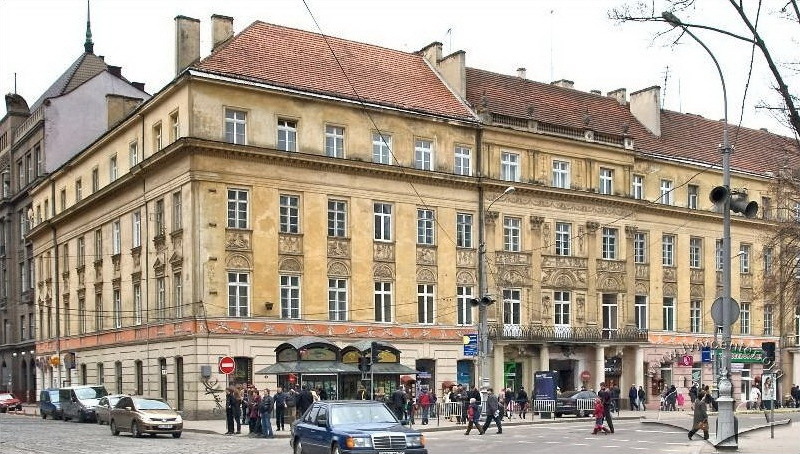 This building is one of the best examples of Empire style buildings in Lviv. Facades are symmetrical. 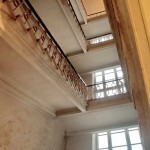 Developed cornice above the third floor and a line above the ground floor divides the building into three horizontal levels. The main façade (from Svobody Ave.) is vertically divided by two symmetrically located ledges with column porticos, balconies (on the second floor) and pilasters. Through passages in ledges the access to the inner yard is provided. Facades are decorated with ornamental and figurative relief compositions on Greek mythology (authors H. Vitver and A. Sсhimser). Rectangular windows are decorated with a profile frames, cornices and frontons. On the one side the relief “Amur and Psyche” (arch. H. Vitver) is depicted. Another relief depicts “Aeneas saves his father” and “Paris kidnaps Elena”. Above the reliefs there is a frieze with puttos (figures of boys). Below the balconies on the second floor there are Doric order columns and consoles in the form of Atlantes. The building was designed under the influence of Vienna architecture of early XIX c. Its facade decorations are considered to be one of the finest examples of Empire style in the city.